Drafting Steals: What types of art portfolio cases are there? When you create great art, you want to be able to protect it the way that it needs to be protected. It would be such a shame if something that you took hours to create got ruined just because you didn't have the right protection for it. This is where art portfolio cases come in. Art portfolio cases are different sorts of protecting units that can house all of your artwork, sketches, large documents, graphs and other important paper items. Art portfolio cases protect your documents and artwork that they don't get damaged, scratched or hurt while you are transporting them or storing them in your home or office. It is important that you always have the proper art portfolio case when you need a place to put your artwork. There are many different types of portfolio cases that you can choose from. First, you have soft-sided portfolio cases that are expandable and can hold several different pieces of artwork as well as poster boards and foam boards. These come in various sizes and prices. You also have portfolio cases that are made out of mesh material. Mesh material is great for portfolio cases because you can see what is in them from the outside, and you don't have to always reach in and root around for what you are looking for. Finally, there are large, heavy duty portfolio cases. These often come in different sizes, but they are generally very big, so they are usually for larger posters and documents. 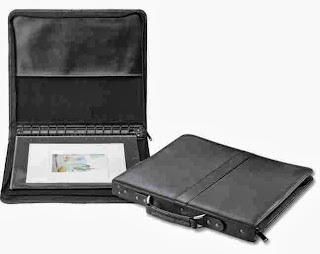 Also, many of the heavy duty prestige portfolio cases have folds and other packets on the outside of the main pocket. These extra pockets allow you to put things like rulers, compasses and pens and pencils in them for easy access. If you are a student of art, drafting or architecture, you need a portfolio case to store your documents and artwork. If you know someone who is pursuing one of these degrees or professions, can art portfolio case also makes a great gift for birthdays or holidays. Check out art portfolios for sale online or in some art supply stores.